Double dipped PVC gauntlet with sandy palm finish for enhanced grip. Jersey lined for extra wearer comfort. Treated to protect against microbial deterioration. Sandy Finish for exceptional grip in water, grease or oil. Lined for added warmth and comfort. Chemprotec is an unlined rubber glove that is available in variable lengths and weights. This rubber glove gives excellent protection against a variety of chemicals and cleaning agents including acids, alkalis and alcohols. It also complies to EN388 safety standards for abrasion and tear resistance. These gloves are unlined, so it lets the wearer use an under-glove for added protection or comfort. These gloves are designed for protection against numerous chemicals such as acids, bases, alcohols, petroleum solvents. Freedom of movement: very comfortable high-quality cotton lining. Multi-purpose chemical resistance (acids, aliphatic solvents) increased by heavyweight rubber coating. Longer working-life for heavy-duty work. Forearm protection: long cuff gloves. Mapa Neotex 340 Neoprene & Latex Chemical Resistant Gauntlets conforms to: EN420 Cat. II EN388 2.2.3.1 EN407 X1XXXX EN374 standards. Exceptionally comfortable and even with its sensitive natural rubber latex material, withstands rough treatment. Extra length added for Longer gauntlet style cuff for extra protection. Maintains a High resistance to water based chemicals. Tough general purpose industrial glove. Approved to EN374 and EN3888. Protective gloves that shields the users hands from Chemicals, liquids and oils. The Showa 771 is fully coated with an extra coat over palm area for added grip. Designed with a rough finish to further improve user grip. Impermeable for working in damp or greasy environments, enabling you to grip objects securely. Very hygienic with anti-odour treatment & antibacterial properties. Anatomical design making it easier to put them on & take off. Globus Showa 771 Nitrile 30Cm Yellow Glove conforms to EN388 4.1.1.1, EN374 standards. Fully coated gloves with extra coating across the hand. The rough finish on the surface improves the user overall grip. Impermeable construction making these gloves ideal when working with liquids. The surface of the glove is textured providing tactile feel and improved grip. Manufactured with an extended forearm providing extended protection. Conforms to EN388:2003, EN374-2-2003, & EN374-3. Mapa Harpon 326 gloves are suitable for long-term wear. Very comfortable gloves due to the comfort of a textile support and good thermal insulation. Comfort and safety when gripping heavy, rough or slippery objects in food industry. Mapa gloves with high resistance to abrasion, exterior finish reinforced grip and interior finish textile support. Reinforced grip for better handling, perfect for fish-handling, handling slippery products and oyster farming. Certificate to mechanical hazards EN 388: 4.1.3.1; Heat and fire protection EN 407; General chemical protection EN 374. Delta plus green pattern drip supported glove. Heat and Cold insulation keeps hand at a comfortable temperature. Exceptional Chemical, Abrasion, and tear resistance. Due to the gloves clever design, a long product life is obtained. Waterproof material repels all liquids. Premium performance, powder-free, nitrile single use disposable glove. Extremely strong and offers greater chemical and puncture resistance than regular nitrile disposables. Provides a greater durability and chemical resistance than many other regular nitrile disposable gloves. Category III, EN374 and EN455 approved. Premium quality nitrile coated examination gloves that offer superior tensile strength. More durable and effective than other Latex and vinyl gloves, lasts twice as long. Designed to be ambidextrous allowing a quick and easy setup process. These gloves are latex free, avoiding any issues with allergens. Manufactured with a beaded cuff making these gloves easier to remove. Automated packaging to enhance single glove dispensing. Exceptional protection when : sandblasting, sanitation, agriculture, and fishing. The material used is Unlined black natural rubber latex glove. Highly resistant to water based chemicals. Chlorinated to harden and cleanse the surface of the glove. Beaded cuff for tear resistance and easy fitting. Marigold Me108 Black Rubber Gauntlet Glove conforms to EN420 Cat.2 EN388 4.1.2.1. EN374 ABCKL safety standards. The Polyco Polychem red PVC chemical resistant gauntlet is a red PVC chemical resistant gauntlet with cotton interlock knitted liner. This chemical resistant glove protects against a variety of chemicals including concentrated acids, alkalis, oils and greases. It has the maximum EN 388 score for abrasion resistance and offers good tear resistance. Excellent abrasion and tear resistant, this glove also has a cotton interlock liner for added comfort. Polyco Polychem P43 Full PVC Dipped Chemical Resistant Gauntlets conforms to: BS EN 374:1994, BS EN 388:1994 standards. Seamless supported PVC gloves with chemical protection for industrial use. 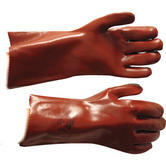 These PVC gloves provide an effective barrier against oils, acids and other chemicals. The glove provides great protection from chemical and biological hazards. The sand blast finish of palm and fingers provides firm grip even handling wet and slippery materials. Soft PVC coating maintains dexterity and pliability at low temperatures. Heat sealed sleeve offers liquid resistance 21 CFR (USA) and European Directives compliant for food applications. Marigold P57B 32cm Extended Sleeve Gauntlet conforms to: EN420+A1, EN388 and EN374 standards. Ideal for use in food processing, chemical industries, oil & gas industry, construction, utilities, maintenance, cleaning. Dipped roughened sandblast finish makes handling wet and slippery materials easier and safer in all conditions. The seamless liner offers very good comfort in use. Good grip in handling both wet and slippery materials. 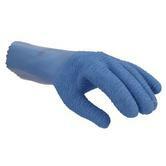 Ansell 92-670 Touchntuff Disposable Blue Gloves conforms to EN374 Safety Standard. Best value Nitrile gloves which fit and feel like Latex Gloves but non-allergenic and lightweight with superior durability. Manufactured with Nitrile making them more durable and improving elasticity. Each of the fingers are micro textured for improved grip and sensitivity. Greater chemical resistance compared to other materials and each batch of gloves is air-tested to detect pinholes. Powder-free gloves leave no residue behind after examination. Reducing chances of any contaminations. Aurelia® gloves conform and are tested to the highest international standards: EN 1186, EN455, EN420, EN388 & EN374. SHOWA 707 s thin Chemical Protection, light glove with a second skin feel. Protects the hand from oils, hydrocarbons, grease and abrasion, with effective long lasting grip. Impermeable for working in damp or greasy environments. Rolled cuff prevents dirt from entering the glove. Nitrile glove surface provides good grip and wet substances can be repelled. Designed for easy movement and continuous wear, gloves are easy to put on and remove. Specific compartments for the right and left hand, to facilitate one-hand specific use ideal in food and pharmaceutical industries. 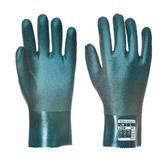 SHOWA 707 N-Dex Nitrile Chemical Protection Glove conforms to: EN388: 2003 1.0.0.1; CAT III EN374-2: 2003 EN374-3: 2003. Nitrile coated gloves providing superior puncture resistance, elasticity and overall resistance. Nitrile Gloves which fit and feel like Latex Gloves but non-allergenic and lightweight with superior durability. The fingers are textured for added grip during tasks. Designed with a beaded cuff for ease of donning. 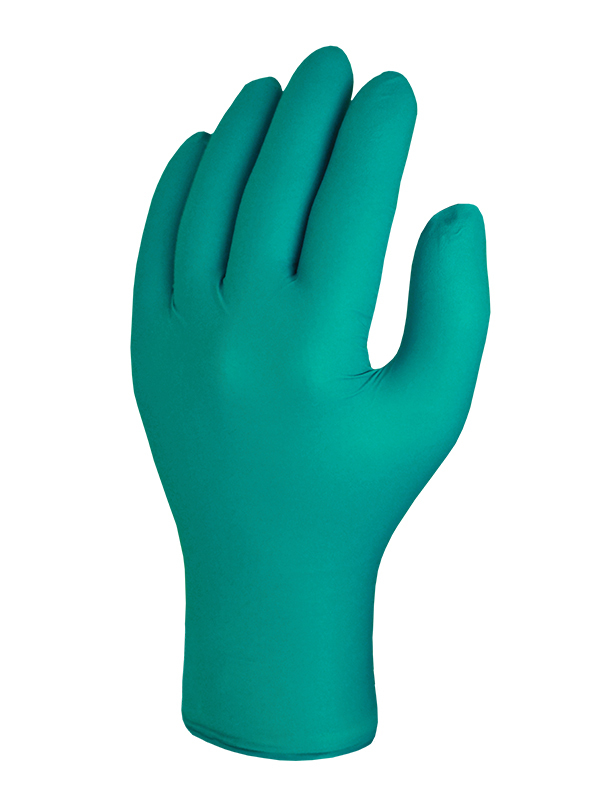 Aurelia Quest Nitrile Powder Free Examination Gloves conforms to EN 1186 Safety Standard. Each batch of gloves is air-tested to detect pinholes. Anatomically shaped for comfort, the Matrix® Nitri-Chem is made from synthetic rubber and contains no latex protein - eliminating protein sensitisation for sensitive skin. It offers good abrasion resistance and has a diamond pattern on the palm ensuring a good grip in both wet and dry conditions. The soft flock lining absorbs perspiration keeping the hands cool and eases donning. Anatomical shape reduces hand fatigue in prolonged use. Polyco Matrix 27-MAT Nitri-Chem Safety Glove conforms to: EN374-1, EN374-2, EN374-3, EN388 3.1.0.1. EN420:2003 standards. Ideal gloves for use in cold conditions - neoprene gloves maintains its elasticity at low temperatures conditions. Ansell Neotop 29-500 protects against a wide range of acids, alcohols, caustics and many solvents. 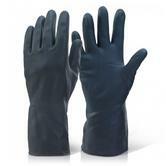 Contains Natural rubber latex Neoprene, much less tiring to the hands than other heavy-duty gloves. Soft and comfortable gloves for Cleaning, Agriculture, Maintenance, Oil & Petrol and Chemical industry. Our chemical gloves are typically certified to the European Norm EN ISO 374 Chemical standard - to protect your hands against chemicals and micro organisms. This chemical resistance glove standard is in addition to the General EN 420 standard for protective gloves, as well as the EN ISO 388 Mechanical risks standard protecting your hands against mechanical risks arising from Abrasion, Cut, Tear and Puncture. Accordingly, all thes chemical resistance gloves are highly certified. Indeed, we choose only trusted manufacturers who are leaders in research and development of chemical protective gloves. 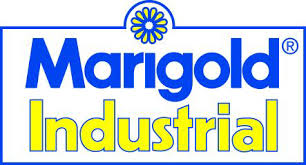 These are recognised brands such as Ansell, ATG, Aurelia, Marigold, Polyco and Showa. ie chemical glove companies who stringently test their gloves, and then exceed the European standards. Thanks to their extensive R and D work, you can now buy the best selling Showa 377 blue dipped glove or the Marigold Me108 black chemical gauntlet, or the super versatile Ansell Sol-Vex 37-695 green gloves or the green ATG Maxichem 56-635 chemical gauntlet. The Polyco Long John PVC gauntlet gives your hands and fore arms full chemical protection. Please do not hesitate to contact us for any specific enquiry.